Combine the cider vinegar, canola oil, sugar and some salt and pepper in a bowl and whisk until the sugar dissolves. 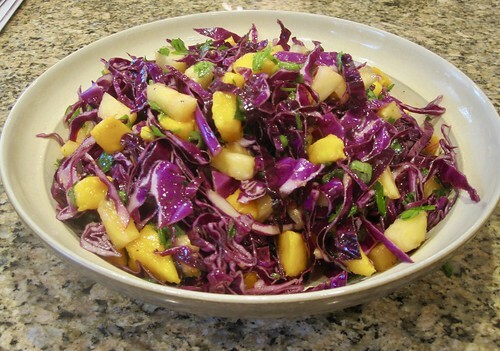 Combine the pineapple, mango and red cabbage in a large bowl. Season with salt and pepper, add the dressing and toss to coat. Add the green onions and cilantro and toss again. Cover and refrigerate for at least 1 hour before serving.